Cinema audiences are entertained and moved/stimulated by actors and performers and some star names attract large numbers of fans. But do we really know why some performances resonate more than others? Film ‘theory’ has some things to say about acting styles and the role of the actor (and the singer, dancer and martial arts performer), but can film studies explain why someone is awarded a prize for ‘acting’ and others are ignored? We’ll use a number of case studies and short narratives to explore a wide range of questions such as do forms of acting differ between cultures (and what happens if we bring them together) and how does acting change over time? Are some forms of performance ‘timeless’? 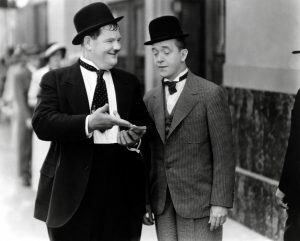 What has given longevity to Laurel and Hardy, but perhaps not to some other performers who were once household names? Will Juliette Binoche always be thought to be a ‘great actress’?